Body Transformation: Body Fat Burnout! Dylan lost weight for military standards and uncovered a fiery drive buried under his oversized body. See how he went from 34 to 10 percent body fat! The decision to transform started as a need. 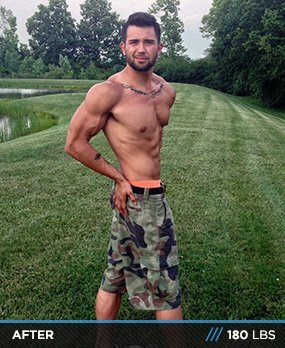 I was 18 years old and my body fat was 34 percent. I decided to enlist in the U.S. Army and found out I didn't meet the standards—I needed to be 24 percent body fat to enlist. But wouldn't let myself fail. I started working out with basic weightlifting knowledge from high school. I reduced my food intake and started to eat healthier. It took three months of eating healthy and working out to hit 24 percent body fat. 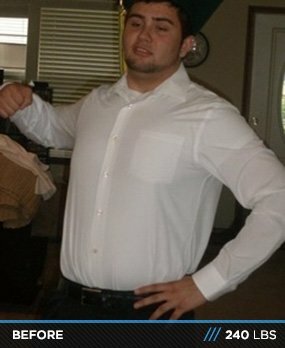 I was amazed that the hard work paid off and how fast I shed fat. At my first duty station with the U.S. Army, I was 220 pounds and 19 percent body fat, but I wasn't content. To feel confident about my physical performance, I decided to make a complete change and get in the best shape possible. Instead of working out, I started to train my body to fit my desires. Throughout the next 18 months, I dropped my body fat to 14 percent and my weight to 200 pounds. In April 2012, I injured my leg in a military accident which hindered my ability to train. Walking became a serious task. I rehabilitated my leg for 10 months, but it wasn't the same. In February 2013, I decided to train again and become the best possible me. It was tough because I can't train legs; I can only swim. Carrying weights to the bench was an issue, but I didn't let it slow me down or hinder my ability to train. I adapted and made sure to find a partner to help me. My transformation had an effect on many people around me. I no longer consider training a task. I surround myself with people who share the same goals and views as me and ask people to train with me. Nutrition played a big part to accomplish my goals. My life changed immensely since I decided to start training. I'm no longer in the military and am now a college student, which means I have more time to accomplish my goals. I enjoy eating healthy and going to the gym every day. My self-confidence and attitude has never been higher. I had many setbacks in my journey, but I made the correct steps and realized I can accomplish anything with determination, attitude, and support. 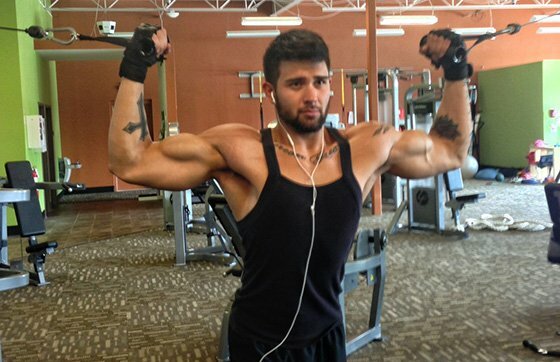 My mentality has never been higher, and I have bodybuilding to thank. Accomplishing my goals wasn't easy. The biggest aspect to accomplish my goals was to surround myself with positive people who share my goals. I met my friend, Tyler, in the Army. He provided my motivation and is a big reason I'm here today. I took him to train every day and eventually received daily texts from him asking if we were training after work. It motivated me to be on time so I wouldn't let him or myself down. Another measure I took to stay motivated was to stay in touch with my lifelong friend, Caleb. He is knowledgeable about anything related to physical fitness. I contacted him regularly to update him on my progress and get advice. I faced many troubles during my journey. I can't count how many times I wanted to quit. The toughest test was my leg injury. I lost motivation because I loved to train legs and run. It took 10 months to step into a gym to train again. Overcoming a life-changing event isn't easy, but it's possible. I was seriously inspired one day when I watched a video of someone who had a worse physical impairment than me, and they were accomplishing their goals. I realized I was making excuses and stepped back into the gym the next day. My supplement list is simple. Supplements shouldn't be relied on. They should be used to supplement your body. Without proper nutrition, you cannot maximize your potential or accomplish your goals. Good nutrition is a must. I use the same training regimen and only change when I need to. I keep the same rep ranges and increase weight as repetitions become easy. The most challenging aspect to overcome was nutrition and my leg injury. Nutrition was a battle through trial and error. I read lots and asked for advice to learn to eat properly. My leg injury required physical therapy and the desire to be better. I had to adapt nearly every exercise to accommodate my injured legs. I plan to continue transforming. I'm nowhere near the ideal version of myself. I also want to become a licensed trainer, which I will work on this fall so I can share everything I learned and motivate others to become their ideal vision. My final fitness plan is to motivate people with injuries and show them how overcome or adapt to them. Read. There's a wealth of knowledge out there waiting for you. Understand what you put into your body and how it will help you. Don't be afraid to ask for advice. You will be amazed how many people will help. Never quit. You will be proud tomorrow of what you did today. 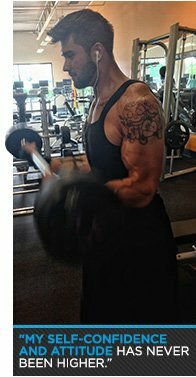 Bodybuilding.com was a big help to accomplish my goals. A friend told me about the site and its deals on supplements. I couldn't get enough of the forums. I read countless forums on nutrition, exercise, and bodybuilding concepts. I read the articles always find them informative.